Happy Mother’s Day!!! Oh wait, that hasn’t happened yet has it? Well look at me getting things done ahead of schedule. Well actually, I think most intelligent bloggers have already published their mother’s day recipes, so I am probably behind, ah well. I tried to get this one to you sooner, but I had to make this recipe four whole times before I got it right! Four delectable, scrumptious, oh this recipe isn’t quite right, better try again, times. Oh the pain. While it’s true I made four batches of these babies before nailing the recipe, it wasn’t a hardship or a burden at all. It was pretty damn fun. When I thought of the idea of making Vegan Earl Grey Cupcakes, I did some good ‘ol internet research. What did I find? A million and two recipes. Ok, I exaggerate, google actually found about 107,000 results. Dang. At first I tried steeping the tea in hot milk like most of the recipes suggested, but that really didn’t get much earl grey-ness into the cupcakes, and also it was difficult (almost impossible), to make just the right amount of steeped milk as an unpredictable amount evaporated or got sucked up by the tea bags. Plan 1, fail. Plan 2 happened when I came across this genius recipe by The Gingered Whisk. The difference here is that instead of trying to steep the tea in something, she just went right ahead and tossed the tea leaves in the batter. I mean come on, so easy peasy, the earl grey flavour is insane, and the cupcakes just turn out so darn cute with their little speckled tea look. So I used the inspiration and adapted my Vegan Vanilla Cupcake recipe to Vegan Earl Grey Cupcake bliss. Plan 2, you are my new favourite. This cupcakes taste like if a cup of earl grey tea, and marshmallow had a baby, and now you just want to eat that baby… but it’s totally vegan I swear. The cupcakes have a potent earl grey taste, but are still light, fluffy and sweet. 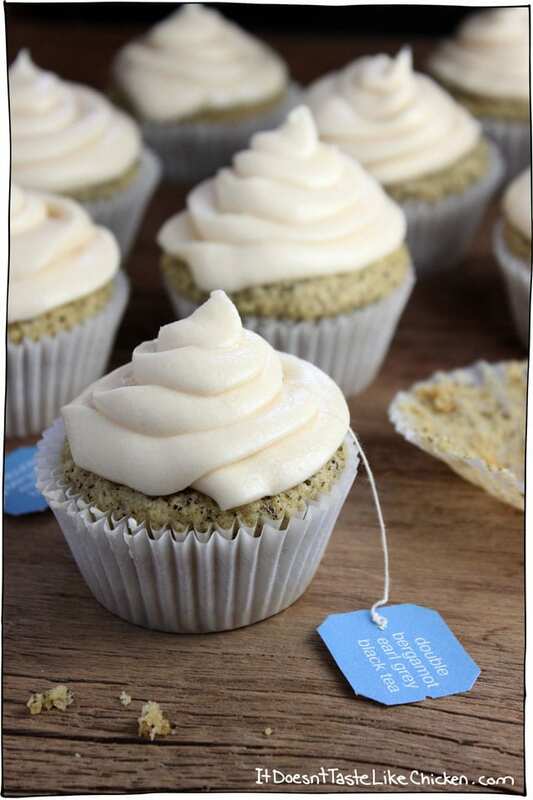 The frosting has just a kiss of earl grey, so not to over power your taste buds, and adds a creamy dreamy, lift your pinky, then shove the whole cupcake in your mouth in one go (what? ), delectableness. Now on to the beautiful baking of cupcakes. 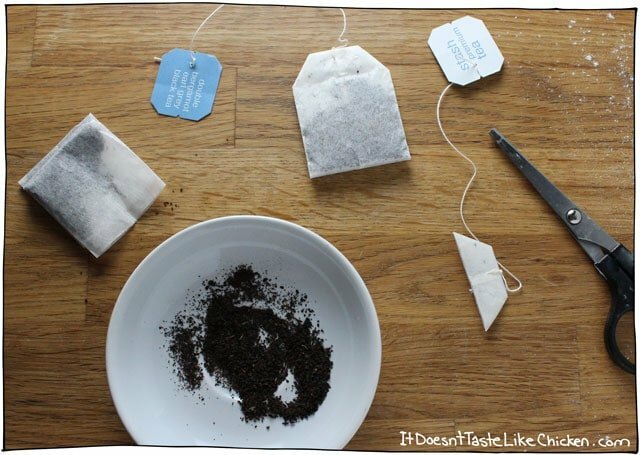 First cut the end off of your tea bags and dump the tea out into a small dish. If it is finely ground like in my picture, you are good to go. If it is a coarser tea with bigger leaves, toss the tea in a food processor or blender and pulse, or grind it in a mortar and pestle until finely ground, but not powder. I used Stash Double Bergamot Earl Grey Tea. Add the tea to a large mixing bowl then add in all of your other dry ingredients. Whisk to combine. In a separate bowl whisk all the wet ingredients. 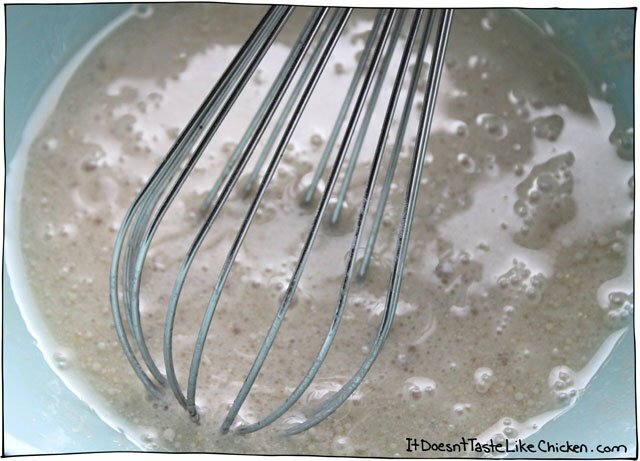 Pour the wet into the dry, then using a spoon (a whisk will get too goopy), to mix the batter until just combined. Don’t over mix the batter or your cupcakes will be sad. 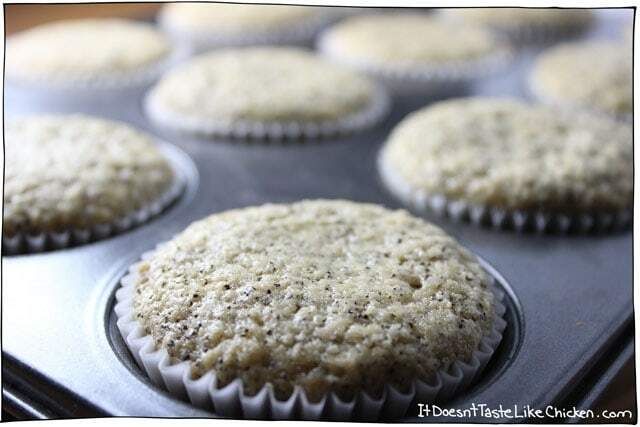 Divide the batter evenly among 12 cupcake liners, or a lightly greased cupcake tray. Bake 18-20 minutes, until a tooth pick inserted into the center comes out clean. To make the frosting, brew one very strong cup of tea. Let the teabag sit in the tea, until it is completely cool. You can do this ahead of time or even the day before so the tea is cool and good to go when you get to making your frosting. When the tea is cool, use an mixer to beat the vegetable shortening and vegan butter together. Add in 1/2 cup of powdered sugar at a time. When all of the powdered sugar is incorporated, add the vanilla extract and 1 tablespoon of the extra strong cooled brewed tea. 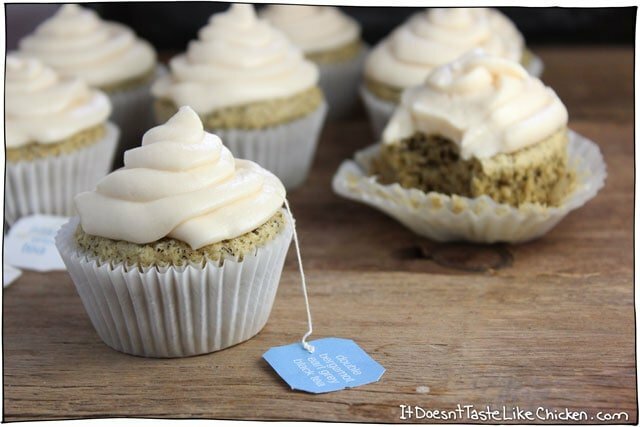 If you like the frosting a little softer, add another tablespoon of the tea until you reach the desired consistency. Use a frosting bag or knife to frost your cupcakes. Or if you are like me, just use a regular old plastic bag. I always choose the strongest bags, and I tape the corner before I snip a hole in the end to reinforce the tip so it doesn’t break. Sneaky deaky tricks. Cupcakes are always best served the day you make the, but still pretty delicious the next day. Whether you are a mother or not, I hope you enjoy the cupcakes! A perfect treat for Mothers Day, any special occasion, or just because you are in a cupcake mood (because who needs an excuse to eat a cupcake). Preheat oven to 350F (180C). Line a cupcake pan with 12 cupcake liners, or lightly grease the pan and set aside. 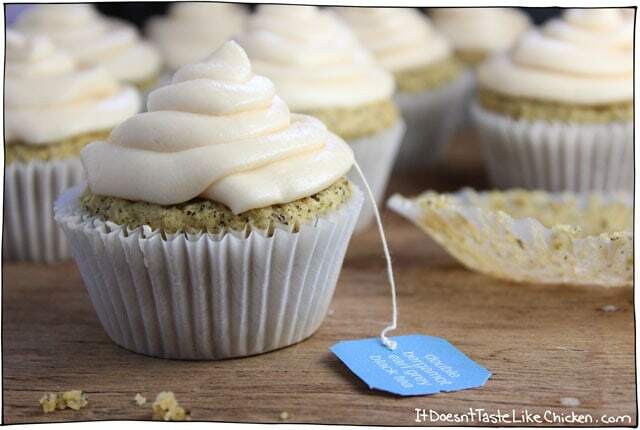 For the cupcakes: cut 4 teabags open and empty the contents into a small bowl. If the tea is a fine grind, you are good to go. If the tea you are using has big leaves or is coarser, pulse it in a food processor, blender, or grind in mortar and pestle until it's a finer grind, but not powder. In a medium bowl, mix together all the wet ingredients: the non-dairy milk, canola oil, apple cider vinegar and vanilla. 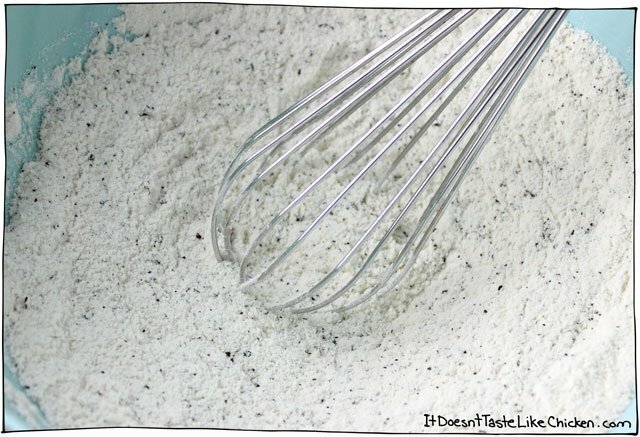 Pour the wet into dry, and using a spoon mix until the ingredients are just combined. Don't overmix. For the frosting: let cupcakes cool completely before frosting. Put the teabag into a small mug and pour in the boiling water. 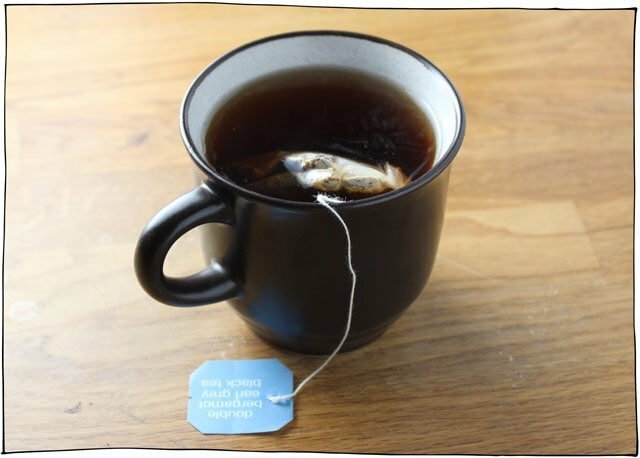 You will only need about 2 tablespoons of the brewed tea, but make a bit extra just in case. Let steep until cool, do not remove the teabag! You want the tea to be very strong. In a mixer, blend the vegetable shortening, vegan butter, powdered sugar and vanilla extract along with 1 tablespoon of the cold extra strong brewed tea. Add 1 more tablespoon of the brewed tea if needed to reach desired consistency. Frost cupcakes as desired. Featured Ingredient: Ear Grey Tea. 37 Days, 25 Recipes to go! My bff and I have a shared loved for london fog lattes so I made these and brought 6 to her place when I went over for dinner. I had one and it was the tastiest cupcake I have ever made; moist, perfectly fluffy, and super flavourful! My bff and her boyfriend managed to eat the 5 other ones that night and were raving about them and could not believe how good they were; they even went out and bought the ingredients to make more the next day! Thanks for such a delicious and simple recipe, I’m not the best baker but they still came out perfectly! Super easy & super yummy (although I think I’ll reduce the amount of sugar next time). Another keeper – thanks! for some reason each time i’ve made these i found the amount didn’t quite make 12 cupcakes, and if it did, they were quite small. I feel that i’m following the steps correctly but..
I’m using self raising flour…and adding a bit of extra baking soda. could that be the culprit or are they supposed to be quite small? Hi Julia, it could contribute, I would always recommend using the ingredients as written especially when baking as it is chemistry. It could also be the size of your cupcake pan. Hope that helps! This recipe is wonderful on its own, but I wanted to share a modification I made to fit a themed event we had. I’m just new enough to baking that I don’t have any baker’s intuition to go off of. I know I can trust your recipes, so I always go to you for what I need. I’m hosting a tea party for my son and his friend, so I decided to make something special that the adults would love too. 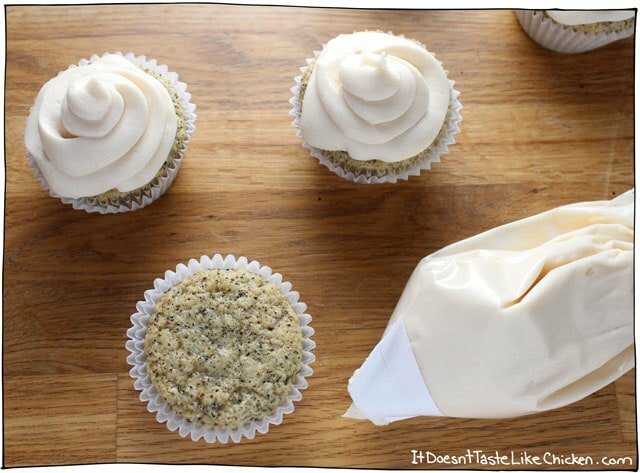 I wanted to make lavender cupcakes, but I also wanted to stick to the tea theme, so I steeped 2 TBSP fresh lavender from our garden into some soy milk, let it cool for about an hour, then used the lavender-infused soy milk in this recipe. It tastes exactly like a Starbucks London Fog Tea Latte (earl grey with lavender and steamed milk with vanilla). Absolutely delicious, and our house smells incredible! Thank you again and again for reliably delicious recipes. Have I mentioned before that I think your recipes are amazing? I made these for mother’s day today and as an added bonus my super-skeptical dad loved them as much as the rest of us did. 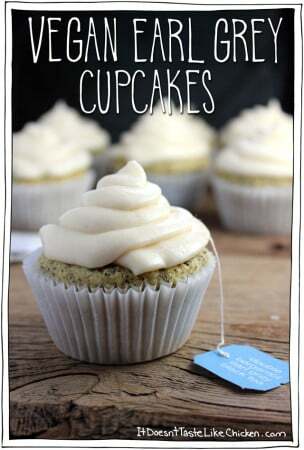 These look so amazing I love the lil tea bag in the cupcake! Can I use coconut oil instead of vegetable shortening and mix it with the vegan butter? Thanks, Cade! You can but coconut oil melts very easily so make sure to keep everything very cold or the frosting may melt. Enjoy! 35-40 minutes. I actually ate a lot of it myself. My parents love it! I have made a couple of loaves for friends and they love it. 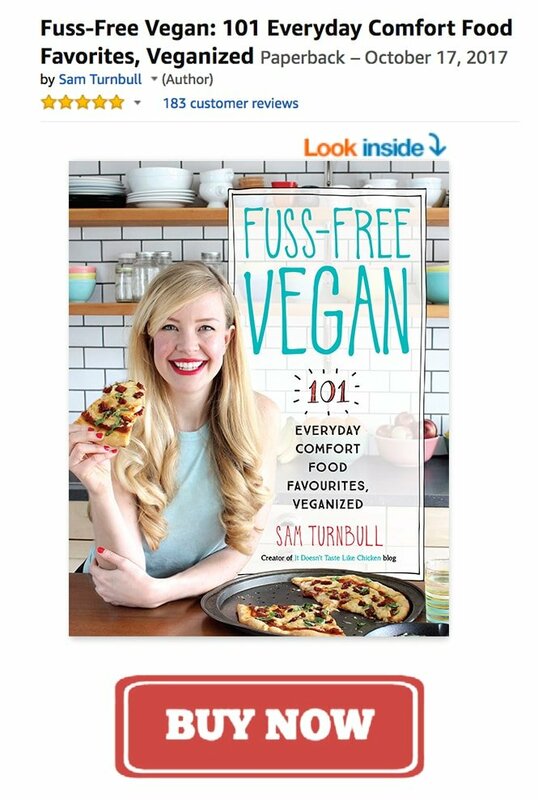 I will be using your recipe as a basis for all my baking now! Thank you. Wonderful! So happy you enjoyed it, Manasa. Happy baking! Don’t even like Earl Grey tea but made these for my husband’s birthday as he loves it. Turns out, it was maybe the best cupcake I’ve ever had. Shared the leftovers with my omni coworkers and they were impressed. I love these cupcakes! I was wondering how would I make this into a cake? Should I double the recipe and put the icing in between or should I make one recipe but then split it in half to put the icing in between? I am newly avid vegan baker. I do have 2 questions about the flour and the sugar part. I love baking with oat flour and almond flour. Would it be a good idea option wise? For the sugar I am sure xylitol could work or maybe add maple syrup? Has anyone tried to play around with the recipe? I LOVE stash earl grey tea! I hope to find it here in Quebec. I have taken a short break from baking although I find it hard to stop looking and drooling over such beautiful desserts! I’m not gluten-free so I’m not super knowledgeable in baking with alternative flours, but I believe both oat flour and almond flour would make a heavier, dense cake. Same goes with the sugar substituting, not really my area of speciality. I suggest checking out this guide for the flours and this guide for the sugars. Hope that helps! I split the recipe in half to try it and I have to say… These came out AMAZING! They are moist, full of flavor, and just perfect. I even messed up the frosting by putting too much tea in and it still came out yummy once I thickened it up again. I used regular Stash Earl Grey and Nutvia shortening (that’s the only vegan kind I could). My roommate loves them! I will be making some for a meeting this week -I can’t wait to share this recipe! I will let people know it came from your blog, I promise! I tried half the recipe with Stash decaf Chai Spice tea. Both my roommate and I tried it. It was good, but not as yummy as the Earl Grey. I’m not sure if I could improve it by using white vinegar or a different brand of chai… I was hoping to mimic a sweet chai latte in a way. I welcome suggestions if anyone has any! Thanks again for sharing this recipe! Woohoo!!! Love that you loved them so much Chris 🙂 I would have to play around with the Chia myself to figure out how to make them extra delicious. If you figure out the key, let us know! I can’t wait to make these!! Can I sub the Earl Grey with Chai? I would like to make both for a meeting. I’m hoping to find a dirty chai version somewhere. I hope you’re well! I absolutely looove your blog! I don’t have a mixer yet… Can I use my Blendtec for mixing? Or can I make the frosting by hand? If I were to make these ahead, do you think I could freeze them and that they would still be good when they thaw? I’m still going to make them, I’m just curious! Woohoo! Thanks for the recommendation! FINALLY got around to making these! And WOW – super delish! Served them to the omnivores at our Sunday dinner and everyone LOVED them. Very moist and so tasty. Thanks Sam!!! Woohoo! So happy you loved them Srivani! Oh these look amazing! Do you have any tips for making them GF? If not, I guess I’ll try my luck and hope I don’t end up with hockey pucks! I’m not skilled at gluten free baking, I have heard good things about Bob’s Red Mill Gluten Free 1 to 1 Baking Flour but have not tried it myself. Sorry I can’t be of more help! My flatmates loved them too (all non-vegan) – these are amazing! I made a big cake with this recipe instead of cupcakes. It was amazing. Just cooked the cake for longer. If I were to make this into an actual (birthday) cake, what would the bake time be? I haven’t tried it myself with this recipe, but I think this would make one 9″ cake and would take 25-30 minutes to bake. I’m just guessing the time, so make sure you keep a close eye on it. You will know it is done when a toothpick inserted into the centre comes out clean. Enjoy! I was wondering if there is a way to substitute vegan butter for something else? Vegan butter is the only thing I don’t already have. Would using more vegetable shortening or curdled coconut milk work as a replacement? If you use more vegetable shortening or coconut oil, it will be missing that buttery flavour, so the frosting just might taste a little flat. Otherwise, I know the shortening will work fine. I haven’t tried coconut oil myself, but as long as you keep it cold I imagine it will work. I made these last night and was lacking the shortening (I was also missing the earl grey, and substituted jasmine tea). I used coconut oil as a substitute and the frosting ended up tasting fabulous! However, it became more of an icing than a frosting – easily remedied after a brief stint in the fridge to re-harden the coconut oil. If you’re in a warmer climate, I’d wait until I had earth balance and shortening or it may melt off the sides of your cupcakes. I literally just made these! They are cooling in my fridge. They smell amazing, thanks for the recipe! I do have a question, as I’m an absolute baking n00b: how do these rise without leavening agents? I’m surprised to see no baking powder or soda or anything in the ingredients list! If we wanted extra-fluffy cupcakes, would adding in a bit of baking powder mess them up in any way, or just make them fluffier than they would be otherwise? Agh, I’m an idiot, and apparently I read the recipe too carelessly, because I now quite obviously see there’s baking soda in the dry ingredients list. Nevermind! Sorry for my carelessness, haha. These are so delicious and so simple to make! I put confectioner’s sugar on top instead of frosting because I was short on time, and even still the cupcake by itself was great and had just the right amount of Earl Grey flavor. Thanks for the recipe! Just made these and turned out incredibly fluffy and fragrant! 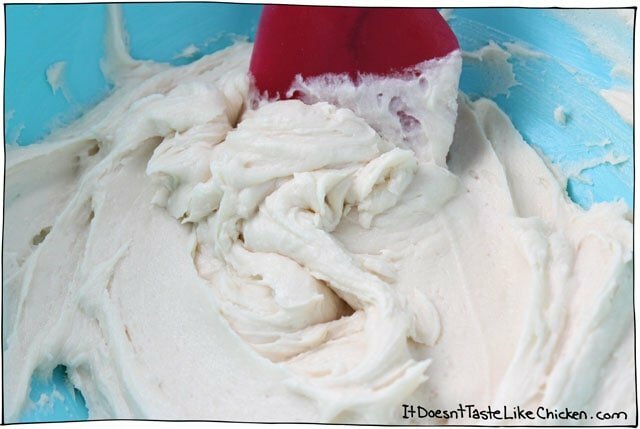 I will probably cut back on a little sugar next time so I can create a vegan earl grey marshmallow frosting. 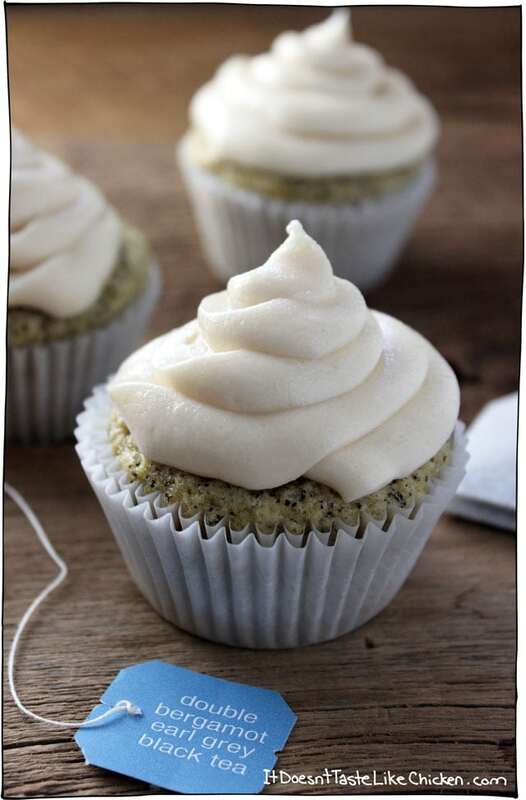 From your experience, if I were to try to replace some of the soy milk with earl grey tea that I have steeped, will that compromise on the fluffiness or texture of the cupcake? I know that mixing in ACV with the soy milk creates some what a “buttermilk” but am not sure if that will impact on the reactions which creates the lovely texture. Chai and marshmallow frosting all sounds like amazing ideas! When I was developing this recipe I first tried to steep the tea in the soy milk. This ended up with pretty unpredictable results, both in flavour and texture. They ended up sinking in the middle quite a bit even though the ratio of milk was the same. I think it must have something to do with the acidity in tea, making the cupcakes rise too quickly and then collapse. So from my experience, this didn’t work for me. I imagine using all tea would have the same result or perhaps even worse. So if possible I would stick with loose tea leaves. Let us know if you try any fun things and how they turn out. Thank you for your quick response! I was thinking that might happen 🙁 Thank you for the advice and will keep you posted chai cupcakes! . Do you have a vegan Jam Drop recipe by any chance? I have just acquired some excellent peach melba jam and wanted to create some vegan jam drops with it but haven’t really found a good recipe. I hope you find a delicious recipe! What should I do differently for high altitude? Unfortunately, have zero knowledge for high altitude baking. Here’s an article I found that might be helpful: https://www.exploratorium.edu/cooking/icooks/article-3-03.html Best of luck! 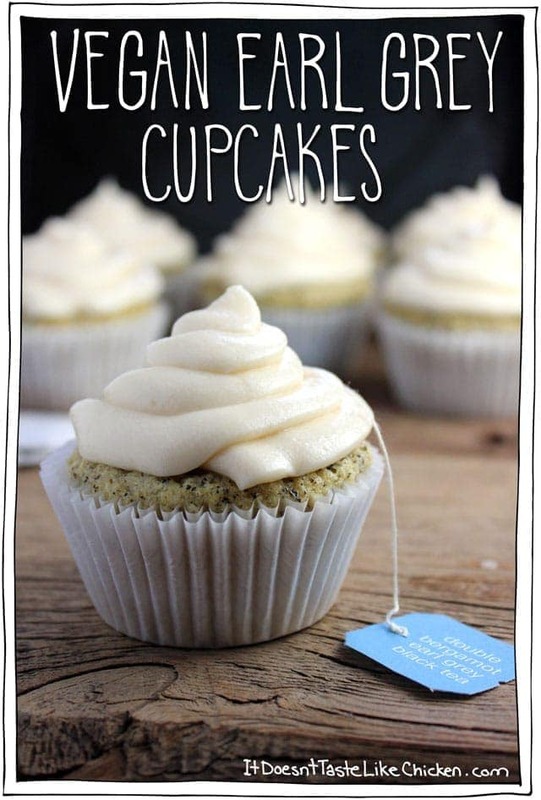 These look so good, and I love the tea bag string hanging from the cupcakes, so cute. 🙂 When I made matcha tea cupcakes I put the powder in the batter, no steeping. They turned out perfect. Thank you Linda! Oooh matcha, that sounds yummy too! Love you girl and thank you for your contributions. You rock! Except I wonder if Earl Grey tea has pesticides in it? I would only use organic teas…. Welcome Soorya! Love ya back 😉 I have no idea how earl grey tea is grown, but I know you can definitely buy organic varieties! Enjoy!